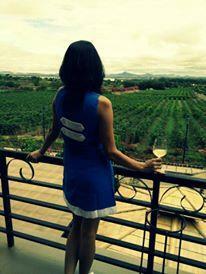 Sula Vineyard in Nashik is a wonderful tourist location. Beyond by Sula is a restaurant which offers an enthralling experience. Read more about our travel and visit to Nashik. Exploring places, food, hotels is always lead to pure happiness and contentment. Have been to several places in India; be it a weekend break, summer vacation, winter vacation, going with my better half, with friends, with family is a self-satisfying experience. Recently planned an impromptu trip for the weekend to Nashik. As it was impromptu getting hotel reservations were not easy. But managed to get a day stay at Beyond by Sula and a day stay at Gateway Nashik. Thinking about Nashik; reminds me of the beautiful outstretched vineyards, stomping of grapes, sipping on sparkling wines and dipping in the pool facing the vineyards. We reside in Mumbai, so whenever we used to think about a weekend break; first thing that use to come to our mind was Lonavla. Actually done and over with Lonavla, explored the place enough, have enjoyed the rains on Tiger point and ate corn pakoda's enough. This time wanted to go little further and another place to live the moment. So we boiled down our options to Nashik. We started our drive at 06:00 am and reached the destination within 4 hrs. Loved the drive in midst of the lust green mountains and great roads to drive. Concrete, smooth and best part no potholes at all. Our stay at Beyond by Sula was incredible. As soon as we took the road for the Sula; we felt that we are reaching a place so serene and quiet. Lush green mountains on both sides; peacocks welcoming us with their melodious call-out from the top of the mountains. Beyond is a place beyond words. Anyone would want to stay there for as many days you want to, as leaving this place was unspeakable. The rooms are big with attached closet, bathrooms giving you a cosy feelings, beds made with great comforters. The staff out there are very friendly and helpful too. The experience of dining at the In-House restaurant is quite and pleasurable, with everything available on the menu; from Indian, Chinese, Continental and good desserts to satisfy one's sweet-tooth. Best feeling one gets when it is raining and you dip in the chilling pool water with a glass of wine near the sun-bed attracting you to savour. Besides this, connecting is the Soma vineyards with its own restaurant and serving good food and bucket of wines of our choice. Just sitting there on the patio, gazing at the vineyards and sipping your rose wine, it's a feeling beyond words. In the evenings we visited the Sula restaurant and went through the vineyard tour and wine tasting for an hour. Now I am aware as how the wines are made, stored in barrels and how is one supposed to relish the taste and how long can you store an open bottle of wine. They have their own store, where one can purchase bar accessories, wines on discounted rates and special souvenirs for your loved ones. The restaurant is contemporary with varied colors to attract and for good clicks. Food out here is with limited menu and truly speaking not that appetizing. You rather enjoyed the view, ambience, and the music and the elite crowd. Also there is lake little close to Beyond; where we attempted fishing and caught one too. But left the fish back as we had no options for cooking. It was a different feeling all together. To summary Stay at Beyond by Sula was the perfect place for peace, serenity to get away for the stressed out city folk. Beyond is quite simply a slice of paradise. The next day we checked in Gateway as no availability of rooms in Beyond. Gateway at Nashik is owned by Taj. It's located in close proximity of the city, connected to the Highway. It's a beautiful place to stay with family, it has big lawns, nice pool, and truly delicious delicacies to justify your appetite. Staying In the busting city of nashik, our next aim was to relish the local food. 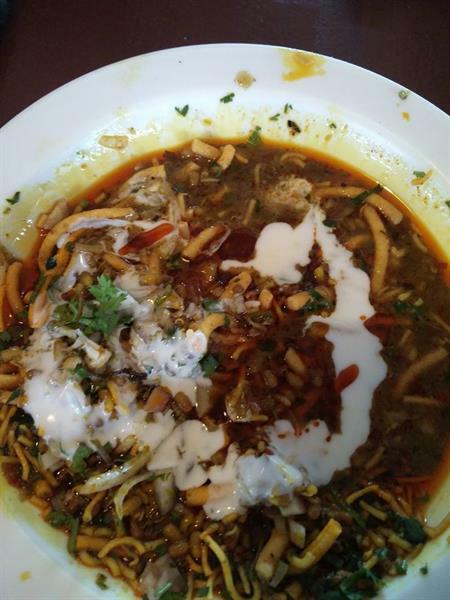 We were glad to found this place "Sadhana Resturant" where they serve only and only Misal Pav. Especially when you are not fond of Misal pav and then rejoicing the dish, is something unexpected. The place has loads of domestic animals to keep the kids engaged. 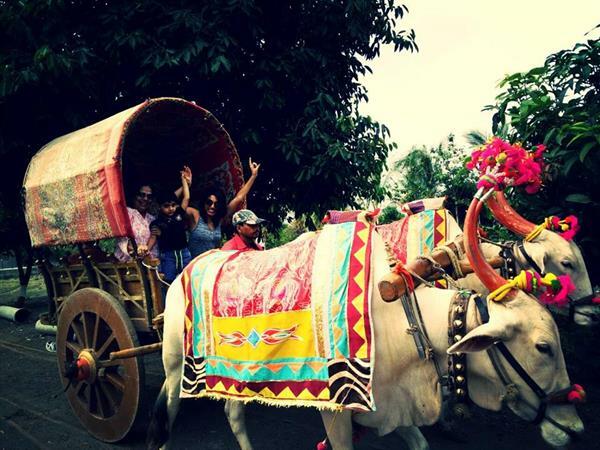 Bullock cart rides to horse rides, feeding the cows, to caressing the sheeps and rabbit. The place is a must visit to get a village life feel at the same time watching so many people enjoying the food and small talks over a missal pav, which is served with loads of onions, two types of gravy (one spicy and medium spicy), papad and just for 70 bucks. Above all, when you get food to eat along with superb service it's like an icing on the cake. Amazing write up by Priya... Would defiantly make a visit to Sula vineyards in Nashik after reading this. It's truly a beautiful tourist destination. Nice Post. This information is really helpful to everyone.